It is my responsibility to gain knowledge of the customs and border agency import regulations of my Country or Jurisdiction and acknowledge that jointheadshop.com and thejointgallery.com will not be responsible for any seizures or delays by any customs or border agencies in my Country or Jurisdiction. Use of these products is entirely at the risk and discretion of the user and jointheadshop.com and thejointgallery.com will not be responsible for any misuse of the products sold herein. 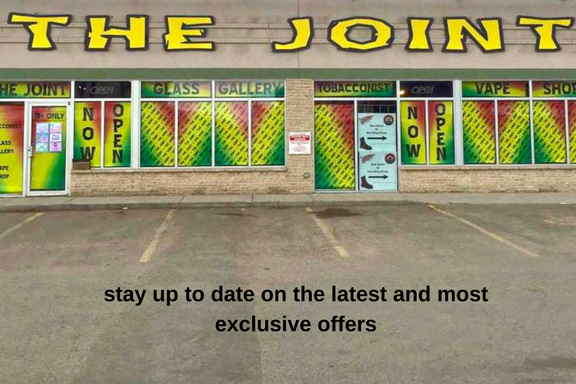 The contents of jointheadshop.com and thejointgallery.com, such as text, graphics, images, information obtained from The Joint Head Shop Inc.`s licensors, and other material contained on jointheadshop.com or any associated third party website are for informational purposes only. The Content contained within jointheadshop.com and thejointgallery.com or any associated third party website is not intended to be a substitute for professional medical advice, diagnosis, or treatment. Always seek the advice of your physician or other qualified health provider with any questions you may have regarding a medical condition. The Content is not intended to be a substitute for professional medical advice, diagnosis, or treatment. Always seek the advice of your physician or other qualified health provider with any questions you may have regarding a medical condition. Never disregard professional medical advice or delay in seeking it because of something you have read on www.jointheadshop.com and thejointgallery.com. No one at jointheadshop.com and thejointgallery.com is a doctor nor do they make claims to be. By browsing and entering jointheadshop.com and thejointgallery.com, I certify that I am 18 years of age or older and that the above statements are true.